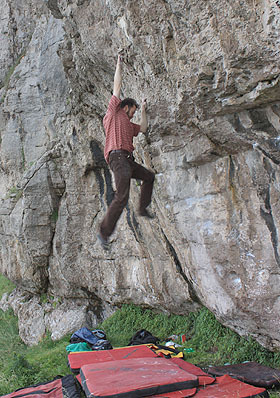 Si Panton and Owen Davies have climbed a series of excellent new problems on the Drive By wall which sits 30m right of Pill Box wall on the Marine Drive in Llandudno. First up was Hip Hop (and you don’t stop) 6C+ which climbs up to the same finishing jugs as the classic Where’s My Hippo but from the groove on the right. 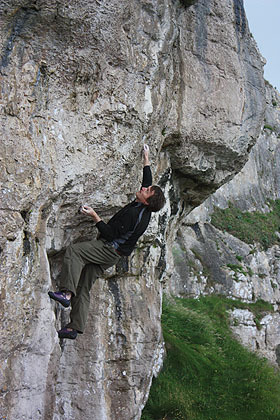 When Owen arrived at the crag he found Si psyching up for the committing last move. With the comfort of a spotter Si went for it and latched the the jug just as his feet ripped. From the groove layback up to a large jug (or if this is wet another edge higher up) then span left to a small undercut. Reach up (right hand) to a poor slopey scoop/pinch – Si held this to reach the jugs but Owen managed to lock the small undercut and reach over with his right (similar difficulty but less alarming). Owen then managed to climb straight up through the bulge on Hip Hop, taking the poor slopey scoop/pinch with your left and making a committing move to the slopey scoop above before finishing on good jugs up left. Regulate rates 6C+ from standing or 7A from the obvious sds at the base of the groove. The sds to Where’s My Hippo is now a touch harder after the main footholds broke off, perhaps bumping the grade to 7A/+ (it was quite a tough 7A in the first place). The quality remains just as good though. Earlier in the session Si also climbed the obvious extension to Les Bos continuing past the layback crack heading left for a further 3m until a final pull upwards gets you to a nice big flatty jug to finish on. 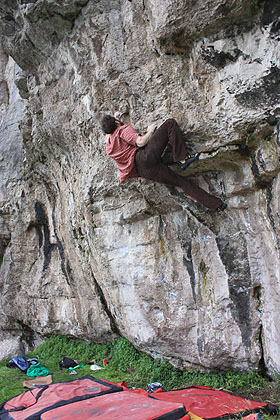 This improves the quality of the problem and bumps the grade a touch to 6C+/7A.